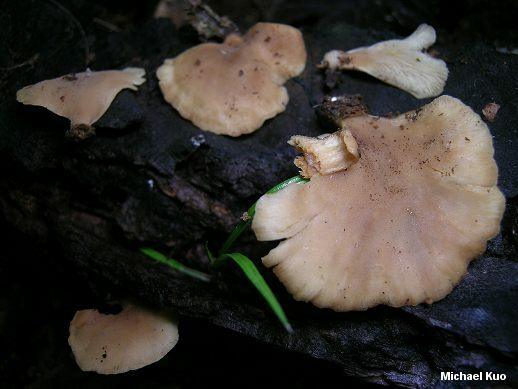 Hohenbuehelia angustata grows on the dead wood of hardwoods throughout eastern North America, but it is not often included in field guides--perhaps because it is a little bit boring. Its flabby, whitish to dull brownish cap is fan-shaped to spoon-shaped; its gills are buff to pale tan; and it lacks a stem. In short, there's not much to look at--unless you put it under the microscope, where its dramatic, thick-walled cystidia (known as "metuloids") more than make up for its macroscopic mundane-ness. 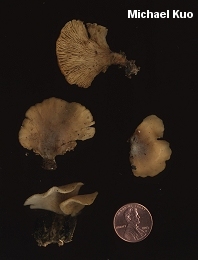 Several species of Crepidotus are similar in appearance, but have brown spore prints and softer flesh. Ecology: Saprobic on well decayed wood of hardwoods; growing gregariously; summer and fall; widely distributed in eastern North America. Cap: 1-6 cm across; convex, becoming planoconvex; fan-shaped to spoon-shaped in outline--or occasionally rolled into a funnel shape; rubbery and moist; fairly smooth, but sometimes finely hairy when young and usually featuring whitish fuzz near the point of attachment; whitish to beige or watery brownish; the margin at first inrolled, later even or wavy. Gills: Close or crowded; whitish, becoming yellowish to dull tan. Stem: Absent, but a tiny pseudo-stem is usually present, attached to white rhizomorphs. Flesh: Whitish to brownish; rubbery. Chemical Reactions: KOH on cap surface negative. 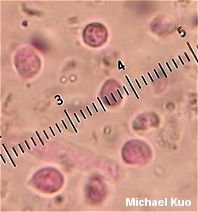 Microscopic Features: Spores 3-5.5 µ; broadly ovoid to subglobose or globose; smooth; inamyloid. 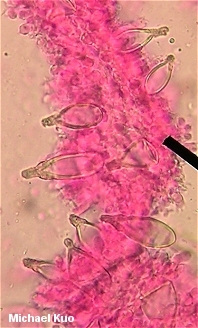 Cheilocystidia fusoid to clavate; to about 35 x 8 µ. Pleurocystidia ("metuloids") abundant; lanceolate to broadly fusoid; to about 75 x 15 µ; with thick (2-3.5 µ) walls and apical encrustations. Pileipellis a thin cutis-like tangle above a thick zone of gelatinized hyphae. Clamp connections present. REFERENCES: (Berkeley, 1847) Singer, 1951. (Saccardo, 1899; Smith, Smith & Weber, 1979; Thorn & Barron, 1986; Barron, 1999; McNeil, 2006.) Herb. Kuo 07030803.